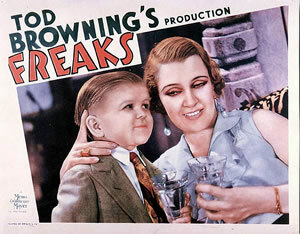 Tod Browning's Freaks (1932) is widely considered to be one of the greatest cult films of all time. Making the #3 spot in Entertainment Weekly’s Top 50 Cult Movies list (from the May 23, 2003 issue), Freaks was edged out only by The Rocky Horror Picture Show (1975) and This is Spinal Tap (1984). This is no small feat for a film over eighty years old in an age when the typical moviegoer thinks movies begin with Star Wars! Freaks began as an attempt by MGM to out-horror every horror film being made at that time. It turned out to be too far over the edge for 1930’s audiences, eliciting gagged responses from audiences and critics alike. It was not until Freaks was rediscovered in the early 1960’s that public opinion of the film began to change, and its reputation began to grow into that of the cult masterpiece it is widely considered to be today. The ‘Freaks’ Show offers some rare documents on this great cult film that will give you a better understanding of the circumstances that yielded this flawed but lovable masterpiece of the macabre. The original script synopsis as found in the MGM vaults; includes annotations about the differences between the script and the final film. The short story Freaks was adapted from. Essay documenting the events surrounding the creation of Freaks. A classic commentary on Freaks and its place in the annals of cinema. Rare stills and promotional photos from the film.